Robots are used for a wide variety of tasks throughout every industry. In fact, as industries seek to automate more and more repetitive and dangerous tasks, robots are increasingly helping to reduce costs and increase efficiency in industrial facilities throughout the world. 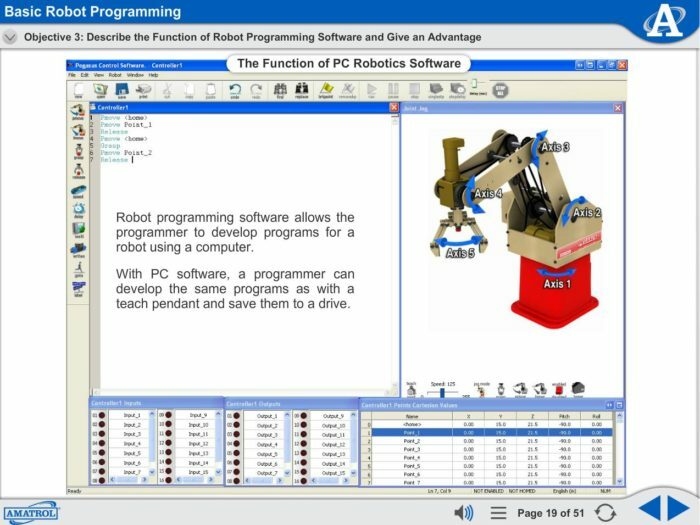 Amatrol’s Multimedia Courseware – Robotics – Computer Programming 1 (M11801) teaches learners essential robot operation and programming concepts applicable throughout modern industry. Learners using Amatrol’s robot operation and programming eLearning course begin by studying the basic principles of robot operation and programming, including the fundamentals of interfacing and material handling. From these building blocks, learners begin practicing industry-relevant robotics skills relevant in a variety of applications, such as flexible manufacturing cells and quality and production control. Learners begin with an introduction to basic robot operation, including power up and shutdown, homing, and end effector operation. Individual lessons focus on topics like robot safety, axes of movement, robot jogging, teach pendants, homing, and end effectors. Learners will also practice skills, such as jogging a servo robot using a teach pendant, homing a servo robot, and manually operating a robot gripper. Learners will study the basics of robot programming, including teaching points and movement and end effector commands. Individual lessons focus on topics like how position points are recorded in a robot’s memory, ways to stop a servo robot, and grasp and release commands. Learners will also practice skills, such as using a teach pendant to teach robot position points, running a servo robot program, and designing a robot program to perform a basic material handling task. Learners using Amatrol’s robot operation and programming eLearning course will study basic principles of interfacing and material handling, including I/O interfacing and looping and speed commands. Individual lessons focus on topics like label and branch commands, I/O interface commands, and applications of robots in material handling. Learners will also practice skills, such as: designing a robot program that uses looping, speed, and delay commands to move an object; connecting digital input and output devices to a robot controller; and designing a robot program that will unload an automatic machine. Learners will study various aspects of application development, including CNC machine loading, robot workcell envelopes, and basic conveyor operation. Individual lessons focus on topics like classifications of robot applications, the work envelope of a double-jointed robot, and types of conveyors. Learners will also practice skills, such as connecting a solenoid-operated pneumatic valve to the output of the robot controller, defining the work envelope of a robot, and connecting and configuring a servo conveyor to a servo robot. 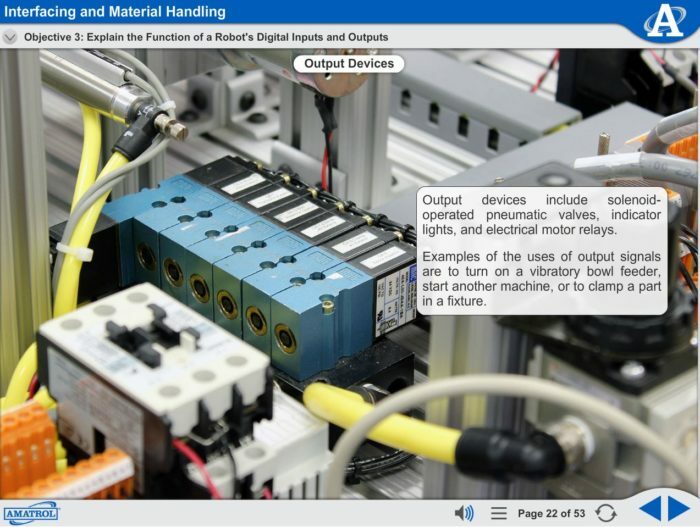 Learners using Amatrol’s robot operation and programming eLearning course will study various aspects and components of flexible manufacturing cells, including servo conveyor operation and subroutine and conditional commands. Individual lessons focus on topics like how to construct a flow chart, how robots are applied to multiple machine loading cells, and how to vary the speed of a conveyor controlled by a robot. Learners will also practice skills, such as designing a robot program that sorts parts, entering a robot program that has subroutine commands, and designing a robot program that uses a servo conveyor. Learners will study various aspects of quality control, including Cartesian coordinate programming, go/no-go inspection, robot operator interfaces, and parts measurement. Individual lessons focus on topics like how a move command is specified using Cartesian coordinates, rules for naming variables, and how robots are used to measure parts. Learners will also practice skills, such as using the Pmove function with Cartesian coordinates to move a robot to a position, designing a robot program to perform a go/no-go inspection, and designing a robot program to inspect parts by measuring them in the robot’s gripper. 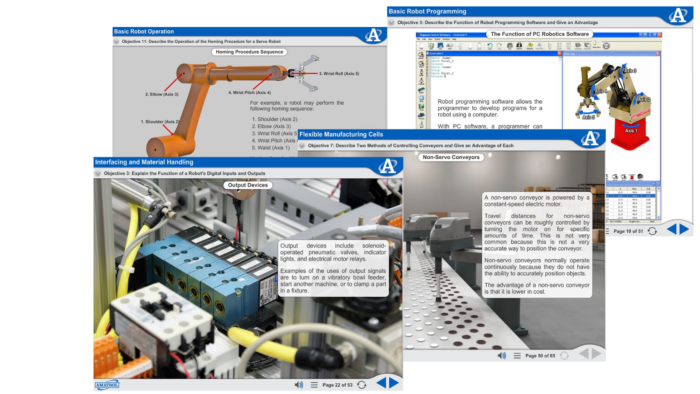 Learners using Amatrol’s robot operation and programming eLearning course will study various aspects of production control, including operator input interfaces, loop commands, and relational and arithmetic operators. Individual lessons focus on topics like basic arithmetic operators, six relational operators, and the operation and function of loop commands. Learners will also practice skills, such as entering a robot program that uses an input command, designing a robot program that stops a production process if a quality standard is not met, and entering a robot program that has loop commands. 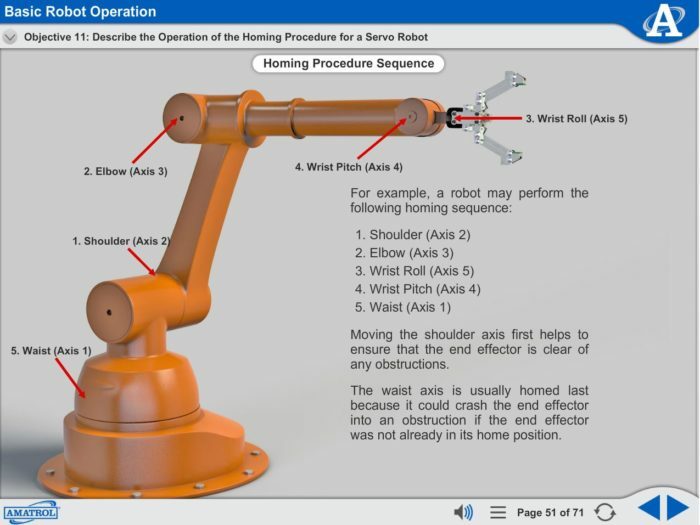 Amatrol’s robot operation and programming eLearning course curriculum features a highly-interactive multimedia format. 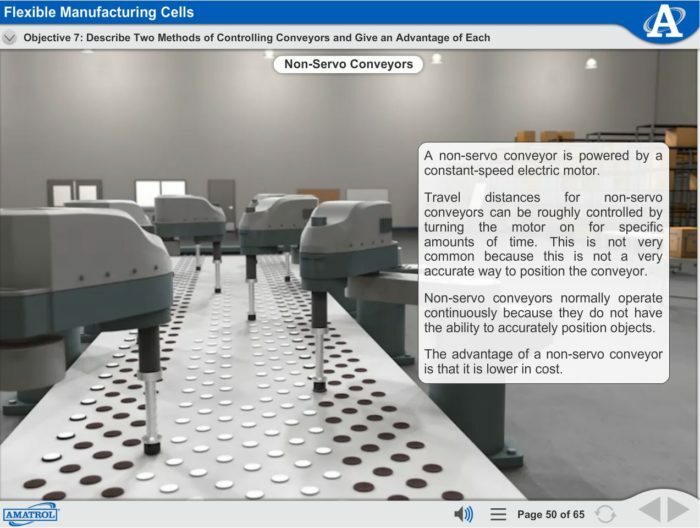 Stunning 3D animations, videos, pictures, voiceovers of all text, and interactive quizzes and exercises bring learning to life. Amatrol’s multimedia curriculum contains elements that will appeal to every learning style, keeping learners motivated and engaged.